Walk, run, strutt, shop and have fun with your best canine friend at Wayside Waifs 22nd Annual Strutt With Your Mutt event this Saturday, September 22. Held in Kansas City's historic Brookside neighborhood, the even includes a 5K race and a 3K walk to raise funds to help Wayside Waifs care for 6,700 abandoned, abused and homeless pets every year. Any animal lover can run, with or without a dog. 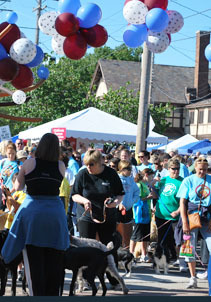 Strutt With Your Mutt Registration is per person and your fee is tax-deductible. Registration includes your participation in either the 5K Race (one with dogs, and one without dogs), 3K Strutt, admission to the Flealess Market, complimentary breakfast provided by Country Club Bank and the Official 2012 Strutt T-shirt! Children 12 and under who wish to participate without a web page or t-shirt, are free. T-shirts are available while supplies last and some t-shirts maybe available the day of event. Day-of registration will begin at 7 a.m.
5K Rescue Race without dogs will begin at 8 a.m.
5K Rescue Race with dogs will begin at 8:15 a.m. The traditional Strutt (3K Walk) will begin at 9 a.m.
Don't want to walk or run? Then enjoy the other fesivities! 100% of the money raised through Strutt With Your Mutt pledges goes directly to the care of homeless pets at Wayside Waifs. They care for more than 6,500 animals each year at their no kill pet adoption center in South Kansas City. Funds also support 10 humane education programs Wayside Waifs offers to students throughout the metropolitan Kansas City area, including NO MORE BULLIES. This benchmark program works to prevent violence by teaching children how to respect, love and understand the unique bond between people and animals. Money raised also supports Wayside Waifs FEMA certified Animal Rescue and Response Team. What a great event, I hope they raise lots of money!